Home » Mid Century Culture » time capsule homes » 6 colorful 1950 vintage bathrooms — The Comer House in Gallatin, Tenn.
6 colorful 1950 vintage bathrooms — The Comer House in Gallatin, Tenn.
Tucked into an historic farmhouse in Tennessee — now home to the Sumner County Convention & Visitors Bureau — are a rainbow of seven vintage pastel bathrooms. 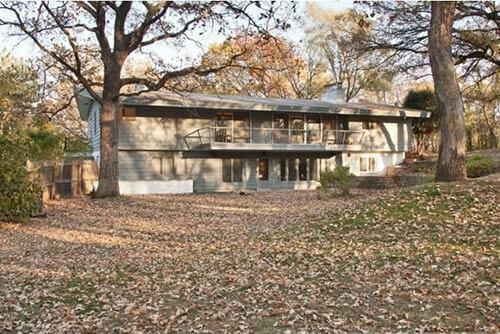 The building is known today as ‘The Comer House’ after the Comer family, which demolished the original 1850 farmhouse down to the foundation and rebuilt it between 1949 and 1951. The house itself is impressive, but its most amazing feature is the variety of color and tile patterns found in the home’s seven bathrooms. 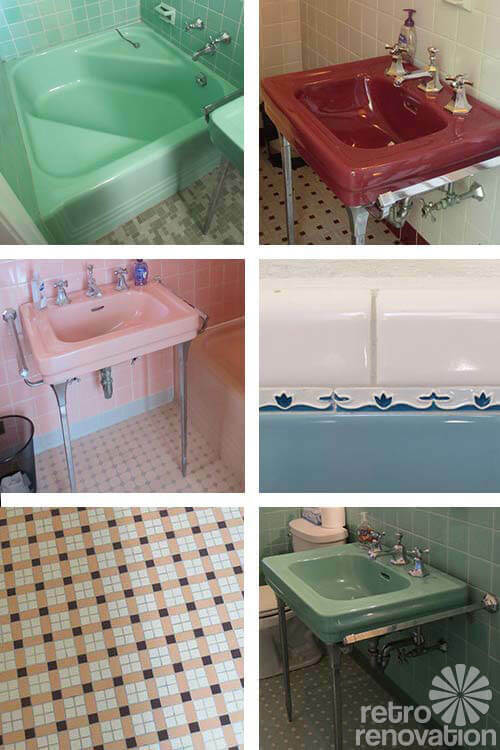 I visited recently and during my visit, I was graciously allowed to photograph six of the seven vintage pastel bathrooms, each of which is sure to inspire. Are these Crane fixtures? Could be. See our 24 page Crane Plumbinb catalog from 1949 here — material from Pam’s personal collection. If not Crane, they are surely American-Standard. Who’s an expert? What do you think? 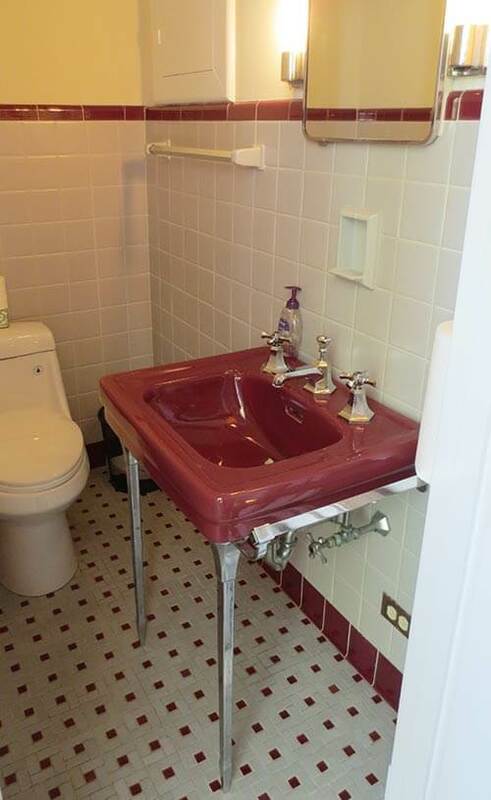 #1 Persian Red and Gray — The first bathroom on the tour was a half bath in maroon and off white. 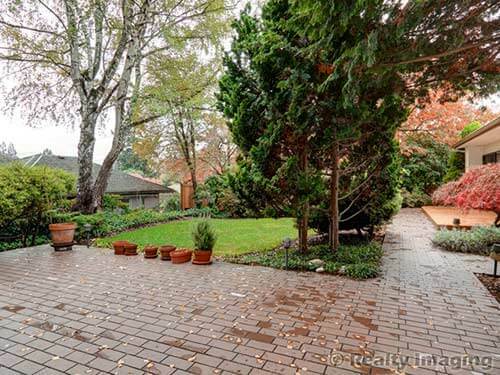 The coordinating pinwheel style floor tiles really add that extra something to the space. I should note that all the bathrooms have newer toilets — most likely because of water use requirements. #2 Ming and Yellow — The next bathroom was a lovely ming green, dark green, white and yellow full bathroom with a standard tub (not pictured). 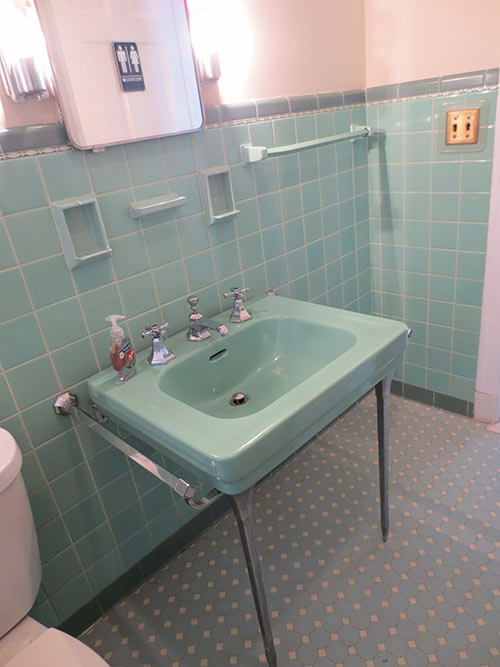 It looks to me like when the house was remodeled, the Comer family must have picked one style of fixtures — same footed wall sink, tubs and faucets — and ordered them in every color. We love this matchy-matchy trick: Even though each bathroom uses different tiles and colors — there is a continuity to the bathrooms as a whole because of the repetition in style of the fixtures, hardware and even the mirrored vanities — giving the house good design sense. 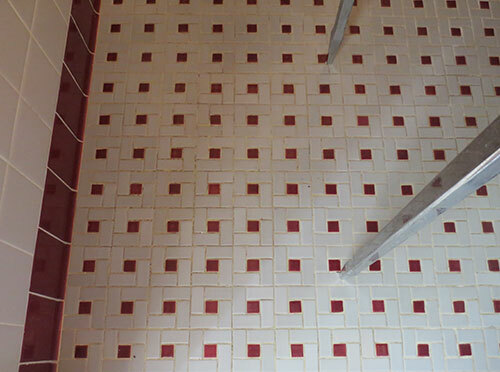 It is the tile colors that really distinguish each bathroom’s personality. The liner tile reminded me of the stash of NOS decorative “sizzle strips” for sale on Ebay that we featured here on the blog a few months back. 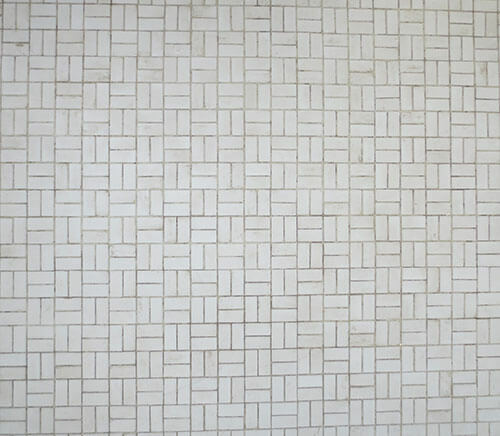 It is nice to see some of these amazing decorative tiles in use out in the wild – they are gorgeous! 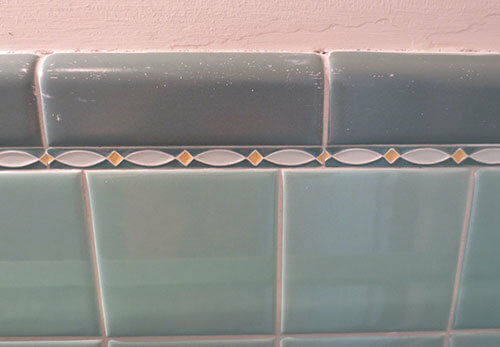 And note in the photo above, how the decorative sizzle strip provides a terrific transition from the light blue field tile to the darker blue bullnose. Brilliant detail design work! 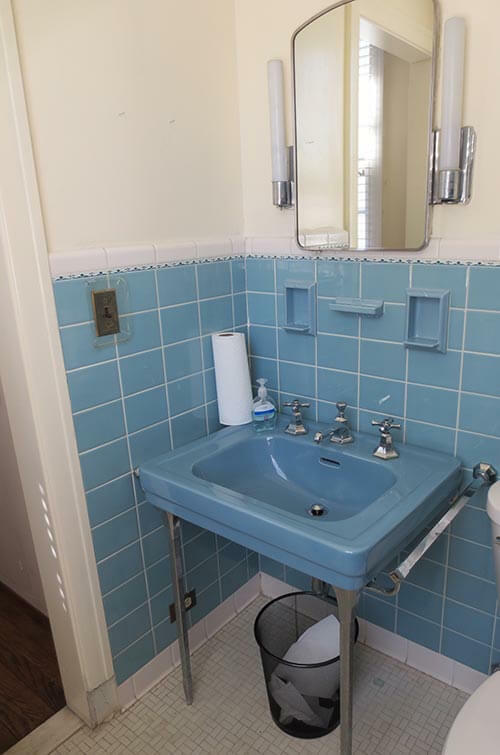 All of the full bathrooms had dual tiled-in ceramic soap dishes and a toothbrush holder set in right over the sink. This vintage green and pale yellow octagon and dot floor had me wishing these color combinations were readily available. Wait. 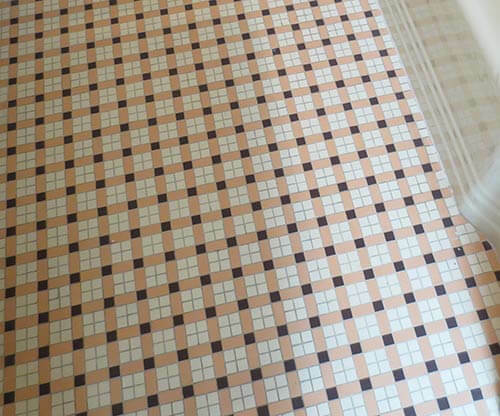 Does Chippy have some alternatives like this at World of Tile? Maybe. Ask! 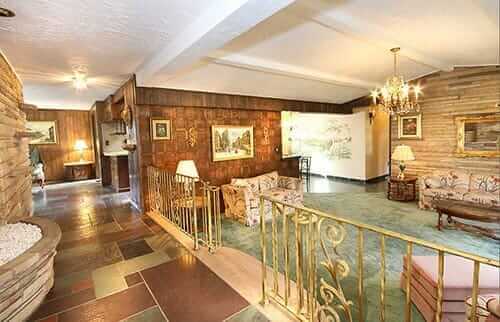 This floor would be perfect in my vintage mint green bathroom. 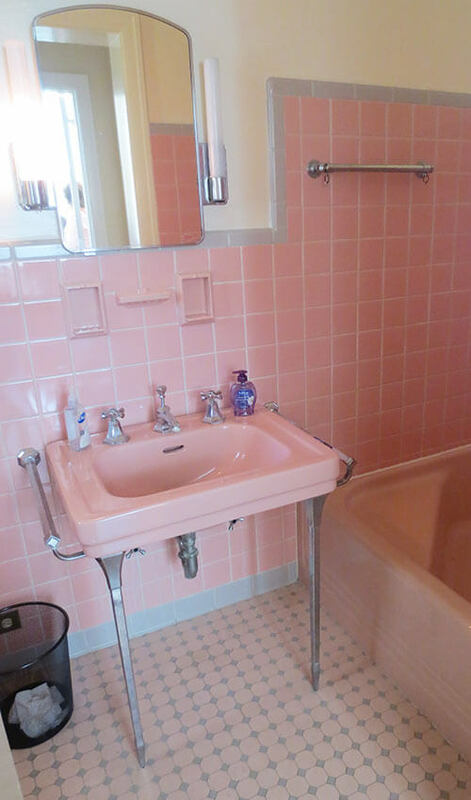 #3 Pink and Gray — Then there was the pink and grey full bathroom — so pretty. What a phenomenal color combination. 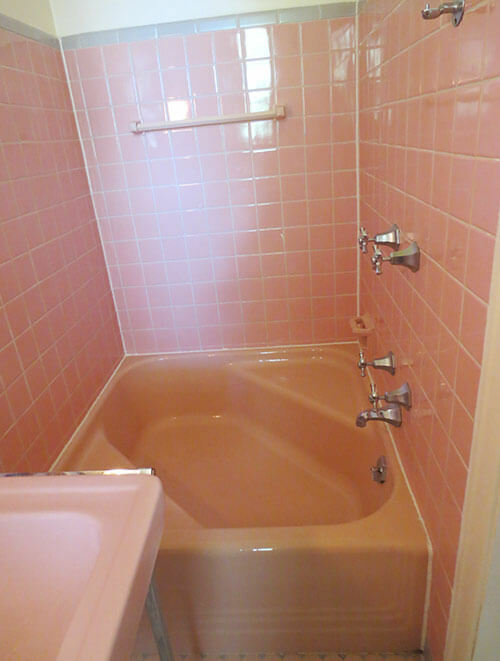 Pam says it’s her favorite of all time, for a pink bathroom. It even had a Cinderella tub. I mentioned my own pink bathroom at home to the woman who worked in the office with the pink bathroom. She was delighted to hear about my efforts and exclaimed that she absolutely loved her adorable pink office bathroom — though I’m sure she has never had the opportunity to use the Cinderella tub. 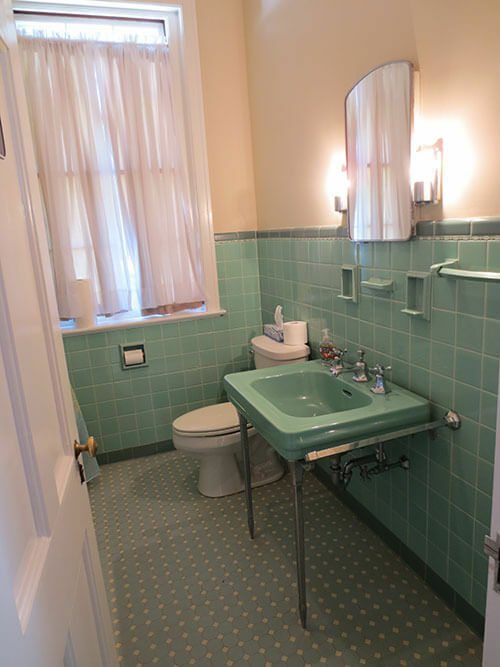 The bluish grey and white octagon and dot floor tile was another happy detail in the beautiful 1950 pink bathroom. #4 Beautiful Blue — The next full bathroom was a blue and white combination with a standard tub. 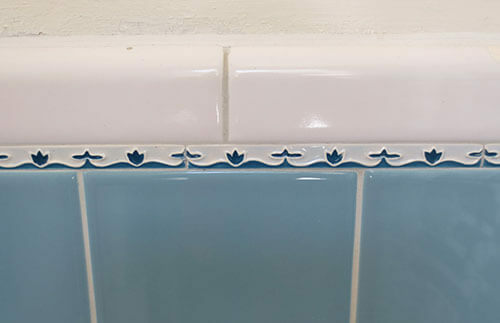 It also had decorative liner tiles in a charming blue and white tulip pattern. 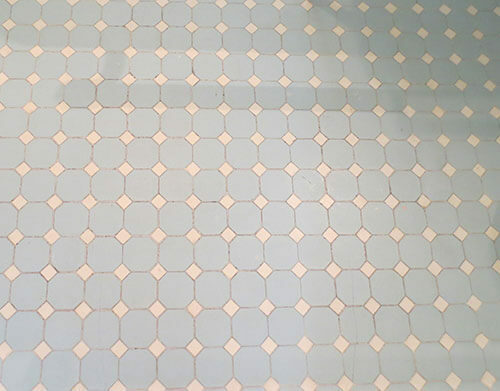 The floor in the blue bathroom was very understated — a simple white — but tile pattern made it look anything but mundane. 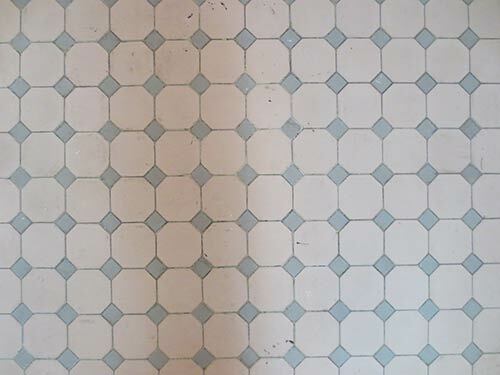 This is a great floor — multidirectional — would be great to replicate in a bathroom today. #5 Ming and Black — Another ming green bathroom was next — this time with a green and black tile combination and another Cinderella tub. All of the bathrooms had the same style of fixtures for the faucets and other hardware. The shape of it is so interesting — and I was thrilled to see the original faucets still in use. 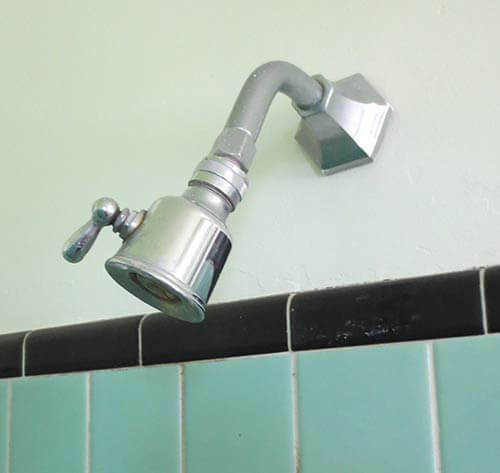 Do you suppose that the handle on the shower head adjusts the flow of water or turns on the shower head? 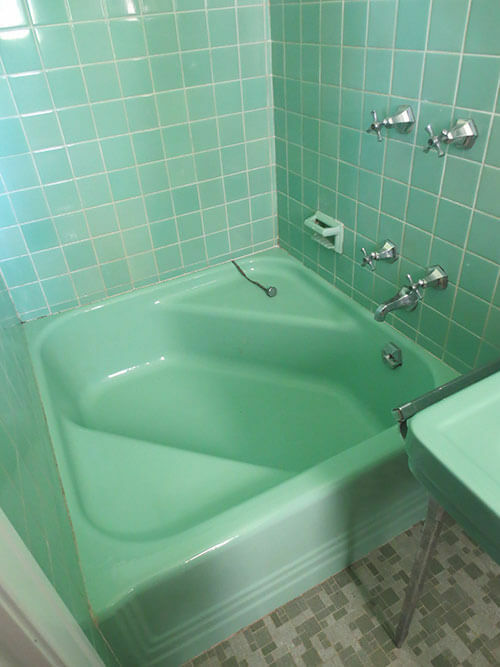 The green floor wasn’t an exact match for the tub, sink and wall tile — but was interesting nonetheless. 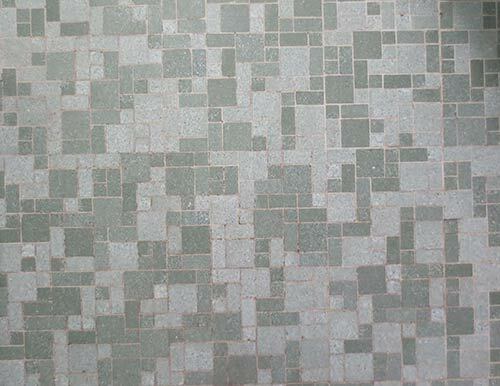 The pattern reminds me of the flooring for my master bathroom remodel — University Pink from Merola tile. 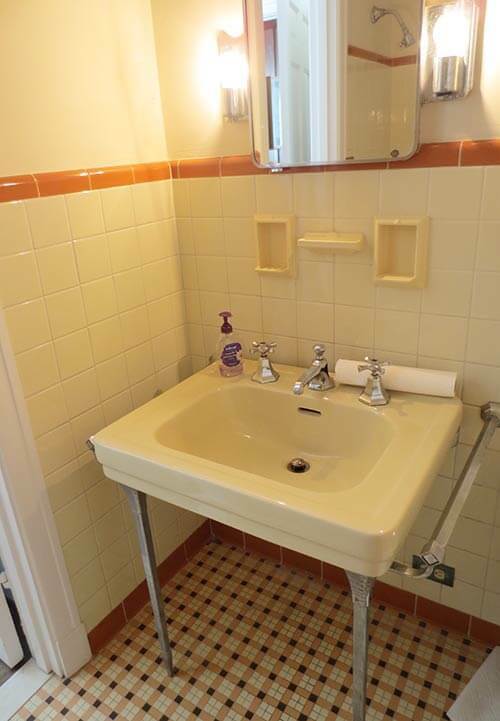 #6 — Butterscotch and Butter — The last bathroom I toured was a full bath with buttery yellow and brick red tile. 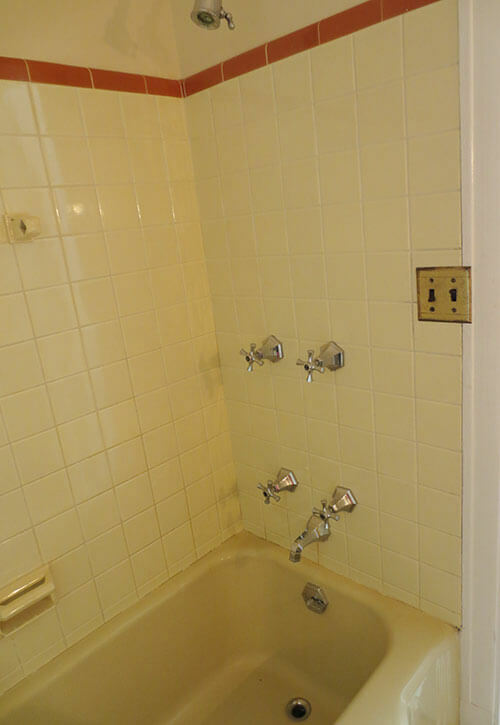 It had a standard size buttery yellow tub and the same faucets as the other baths. The real show stopper was the charming tile floor, which reminded me of some of the plaid tile patterns from the vintage 1929 Freidrichsen Floor & Wall Tile catalog. This was my favorite floor pattern of the bunch — it brought all the colors of the bathroom together so nicely and really gave a customized feel to the space. Mega thanks goes out to Kelley Dickey, Administrative Assistant at the Sumner County Convention & Visitors Bureau for agreeing to give me a special access tour of all the wonderful vintage bathrooms at the Comer House — as well as the inhabitants of the offices who didn’t think it strange that I wanted to photograph their bathrooms. 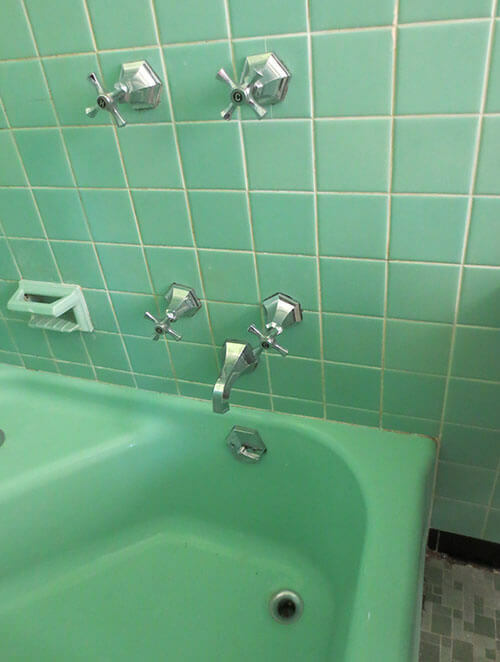 Thanks also to my Mom for alerting me to such an awesome collection of vintage bathrooms. Readers — which bathroom is your favorite? Bernard Maybeck’s family home — Enchanting 1932 time capsule storybook cottage, Berkeley, Calif.
That yellow butter one looks dangerous with the light switches so close to the tub! I own a 50s house with the original black and white tile bathroom. I need to replace old sink. Not sure how to get it off tiled wall with out breaking tiles. It is attached really well with . any suggestions? Where can I get an American Standard shower head like the in the photo. We have one in our old house, but we need a second one . Let me see what I can find out. Watch the blog daily for a follow up story.